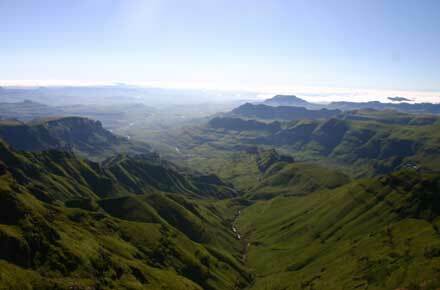 An outstanding 65km trek along the high edge of the very special northern Drakensberg escarpment. One of the worlds Top 10 walks: everyone should do this in their lifetime. Superb views from the vast cliffs that form the edge of the high plateau of Lesotho, across to famous formations and down over spires and buttresses, ridges and gorges to the plains of Kwazulu-Natal. Rich and beautiful vegetation, animals and birds. Sotho herdsmen and bushmen rock paintings. A tough trek in remote mountains, on which you will have to be completely self-sufficient: be prepared. 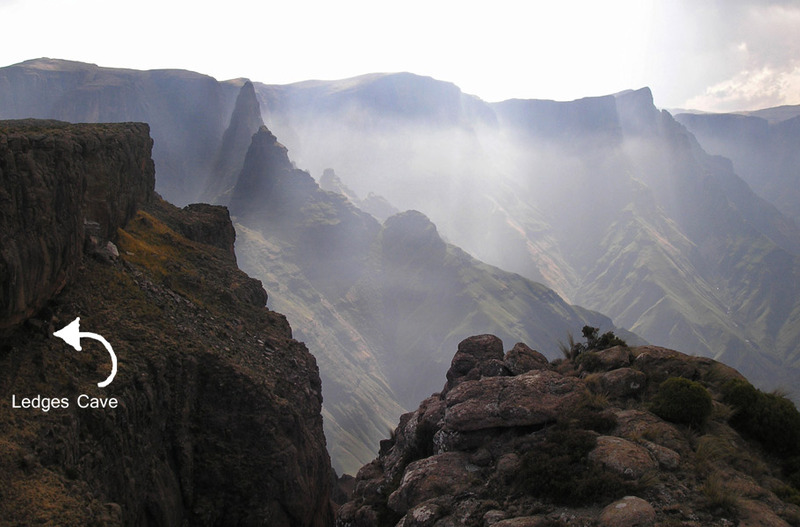 The magnificent Drakensberg escarpment forms the edge, at around 3,000m, of the high Lesotho plateau. Volcanic basalt was forced up some 180 million years ago, and spread to form a layer more than a kilometre thick over earlier sandstone. The eastern end has eroded into a line of tremendous over 200km long, which form the effective border between South Africa and Lesotho. Here you will gaze on famous and fantastical formations and long, grassy ridges and gorges descending into the plains some 1,800m (6,000ft) below. The sandstone foothills the Little Berg are very special in their own right, a maze of canyons and rocky ridges. Their lush, flowery greenness for much of the year will surprise many travellers expecting desert and dry rock. The scale here is deceptive: you have to concentrate to appreciate the vastness of the cliffs drops of 1,000 metres are not unusual. You can sometimes feel you are looking at the gorges of the Little Berg through the wrong end of a telescope. Behind the escarpment is a broken, treeless plateau of rough grass and low alpine shrubs which is reminiscent of Scotland, or parts of Mongolia. Meeting the sudden jagged edge of the escarpment as you tramp across this beautiful but seemingly regular landscape never ceases to amaze. Lesotho is a small, dirt poor kingdom trapped within South Africa. Here on the high plateau, you may meet the Sotho herdsmen living in rough little kraals in summer. Drakensberg means Dragons Mountains in Afrikaans; they are the Barrier of Spears to the Zulus, whose kraals are scattered up the valleys of the Lower Berg, their herds grazing complacently on the lower slopes. There are few real tracks here: much of the time you are crossing rough ground, sometimes on tenuous animal trails. That said, much of it is surprisingly easy going not like trying to traverse a Scottish heather hillside, for instance. The walk along the northern end of the escarpment passes through arguably the most dramatic and remotest scenery of all. There are various ways of tackling the trail; most people start at The Sentinel, walking southward to the Rockeries Pass or (an extra day) the passes around Cathedral Peak. The trail from the roadhead, below the famous free-standing tower, The Sentinel is a delight, winding round the contours of the ridge, then zigzagging up to the first stupendous view, on the western rim of the Amphitheatre, immediately below The Sentinels thousand-foot red basalt cliffs. After scaling the infamous chain ladders, the top of the escarpment is a revelation: rocky hillsides rising from shallow, grassy glens, thistles and even heather eking out a living amid the tussocks. At the top of the nearby Tugela Falls, you will intoxicate yourself with the wondrous view out from the middle of the Amphitheatre. You can do a day walk to the falls and back down. A long but beautiful day, crossing the high plateau. You will pass Sotho kraals, ford streams, and enjoy wide and varied views, including the plateaus sudden, brutal termination at the escarpment edge. Behind the relative order and reason of the plateau hillsides, all is crazed anarchy: violent spikes and broken buttresses appear and then vanish again amid shreds of rising cloud. A long day near the escarpment edge. 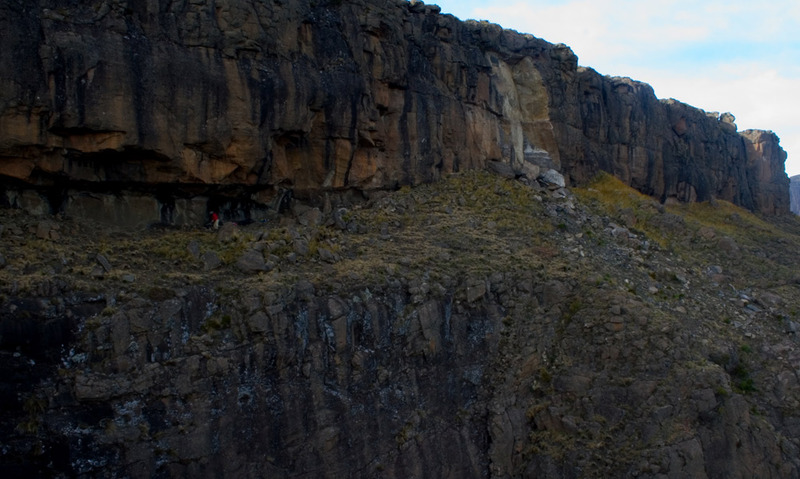 The highlight is the Hanging Valleys, which spill into the great hole that is the Mnweni Cutback. Fabulous spires may come and go through gauzy mist. You have to sleep in the high Mponjwane Cave beneath a peak right on the escarpment edge. The berg is full of these caves - more wind-scoured overhangs, really - but this one is special, large enough to sleep 12, with views out onto the huge, free-standing Mponjwane Tower, across lower spikes and down to the sensuous green ridges and gorges of the Little Berg far below. Today takes you down the Rockeries Pass gorge, a superb descent on a zigzagging mule track, the route of marijuana smuggles and rustlers. You emerge into a new and wondrous world: a gorge winding amid tremendous cliffs and long tussocky slopes; waterfalls tumble in on each side, and the vegetation seems to change with each bend in the trail: meadow flowers, small shrubs, then cycads and remarkable proteas. The valley meanders between cliffs and sexily curved slopes and ridges. It can feel like a few minutes after The Creation. You will wade the thigh-deep river several times. The valley gets wider and softer and you pass grazing herds and neat kraals of round, thatched huts among little fields of maize. Congratulations on a great website. As a South African living in the UK I was feeling homesick and typed my favourite place in all the world into google (= Mnweni) and so came across your site. So far I've done 9 of the top 100 = Inca Trail, Berg, Torres/FitzRoy, Hadrians wall, Colca canyon, Simien mountains, Tongariro crossing, Pembrokeshire Coast path and SW coast path. I agree superb walks one and all (personally would have scored the Ethiopian Simiens a little higher, for the Gelada Baboons alone!) I'm very glad you enjoyed the Northern Drakensberg as much as you did, it's such a forgotten part of the world which of course adds to its substantial charm. Having hiked all over the world since leaving South Africa I've always been surprised that the Drakensberg isn't better known as a superb walking destination by other travellers because I've always thought it world class, and I'm glad to see you agree. If I must add in a few notes - from the Escarpment above Rockeries Pass there are two potential caves to sleep in. William went for Mponjwana, which I agree is a fine cave, but not too far away is Ledges Cave and in my book there is no contest. Mponjwana may get the best sunrise view, but for sheer drama Ledges is hard to beat, and my favourite cave in the entire mountain range. As it's name suggests it's perched on a ledge overlooking the Mnweni Cutback and the Mnweni Valley, you descend to from the escarpment edge, and sleep a few yards from the cliff edge. The views are hard to beat. I'll attach a few photo's to show you what you missed (mean I know). The other big descision is on the Descent to Mnweni Cultural Centre, and again I'm afraid I'm disagreeing. Rockeries is no doubt a fine pass, and the views of the Saddle especially are grand. 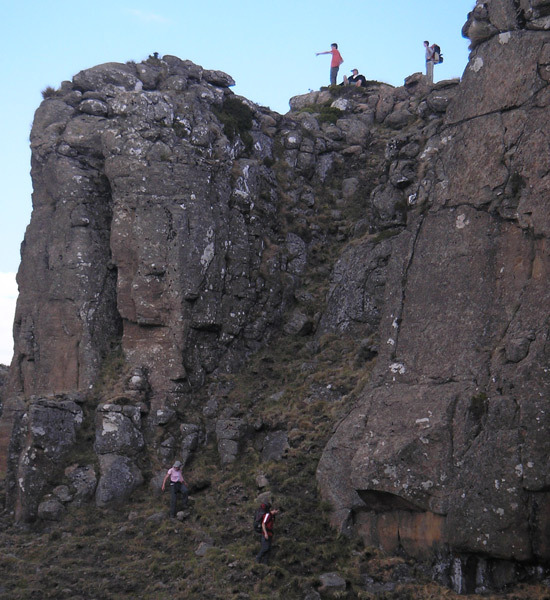 But go the other way down Mnweni Pass,and the Mnweni Pinnacles and the Mnweni Cutback are your comapnions on descent. It's a tough call but for me the clincher is the walk from the bottom of the pass back to the Cultural centre, where the Mnweni valley and the very awesome Mnweni pools (nicest Sandstone pools in the Berg bar none!) mean it's no contest I'm afraid. Thanks for scratching my homesickness itch. A great walk now being mentioned as one of the top 10 most dangerous hike by the Outside magazine. I would also suggest using a guide. i used www.govertical.co.za . An experience that i will remember for the rest of my life.